The purpose of this master-class is to discuss and to set in context some of Newton’s philosophical, scientific and theological projects. It aims to address a number of well-known (and difficult) questions in a new context, by setting them comparatively against the natural philosophical and theological background of early modern thought. By bringing together a group of experts on various aspects of Newton’s thought with experts on Descartes, Bacon and Leibniz, the master-class facilitates interdisciplinary and cross-disciplinary perspectives. The activities of the master-class will consist of lectures, reading groups and seminars, as well as more informal activities (tutorials, and discussions). The master-class will be set within the interdisciplinary environment of the Institute of Research in the Humanities, University of Bucharest. Yannick Van den Abbeel, (Free University, Brussels), Ovidiu Babes (University of Bucharest), Ilinca Damian (University of Bucharest), Michael Deckard (Lenoir-Rhyne University/University of Bucharest), Mihnea Dobre (University of Bucharest), Daria Drozdova (HSE School of Philosophy, Moscow), Johnatan Ettel (Stanford University), Ildikó Erdei (PhD student, Károli Gáspár University of the Reformed Church, Hungary), Britany French (Simon Fraser University), Erdmann Georg, (Ruhr-University Bochum), Larisa Gogianu (University of Bucharest), Remus Manoila (University of Bucharest) Marco Storni (ENS, Paris), Grigore Vida (University of Bucharest), Gabor A. Zemplen (Budapest University of Technology). 18.00 Rob Iliffe, Newton, providence and the nature of miracles. 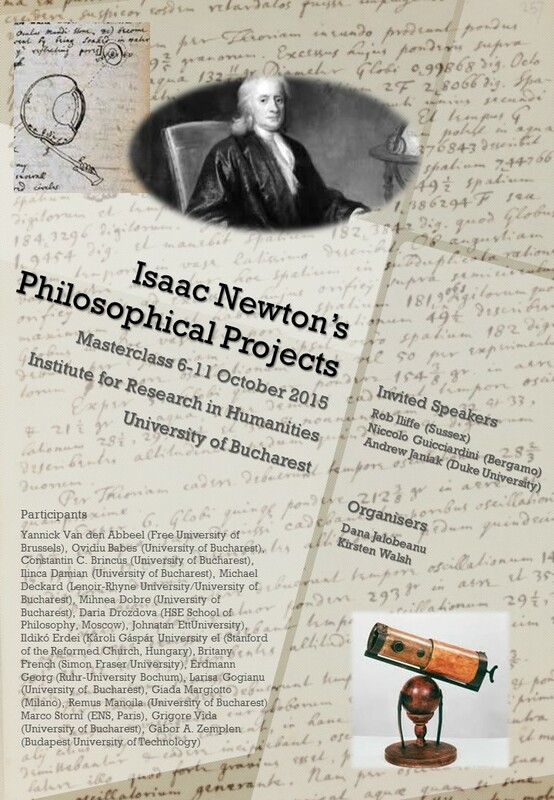 Talk (16-17:40): Mihnea Dobre, Baconianism, Cartesianism, and Newtonianism. Jacques Rohault’s Treatise on Physics and Samuel Clarke’s Newtonian annotations. At the Faculty of Philosophy, University of Bucharest (Splaiul Independentei 204, Room Titu Maiorescu). Talk (18-20) CELFIS talk: Rob Iliffe, The Newton Project as a solution to the problem of intellectual coherence. Talk (11.30-13.30): Kirsten Walsh, Are Newton’s queries hypotheses? Talk (18-20): Dana Jalobeanu, Types of hypotheses in Newton’s queries: a Baconian inheritance? Talk (9-11): Niccolo Guicciardini, Newton’s conceptions on mathematical method: an overview from his early years to the polemic with Leibniz. Reading group (11-13): Newton’s statements on mathematical method, mostly from his mathematical writings edited by Whiteside. Talk (9-11): Andrew Janiak, Newton’s understanding of Scriptural interpretation as it developed during the 1680s and influenced at least one famous passage in the first edition of the Principia. Reading group (11-13:30): Principia (Scholium to the definitions, Rules of reasoning and General Scholium), Newton’s correspondence with Burnet.